When did DS9 start getting good? So this was brought up in a thread like a year ago, but I couldn't find it. One of you had a list or something of the good DS9 eps, since lets face it: the show did have alot of crappy seasons. DS9 started to get good when Thomas Riker grew his beard. Last edited by Dr Dance; 01-05-2018 at 11:01..
Basically when Sisko went bald. edit: although even season 1 has some good moments, Duet is a ****ing brilliant episode. 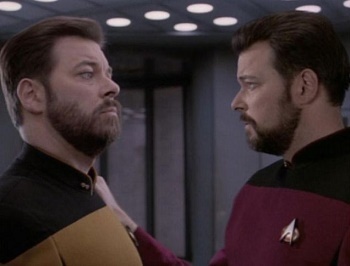 I thought thomas riker was TNG. Was he on ds9? Tribal War: at what point does ds9 get good BOB, 09-17-2017, 12:19 PM.